The following are books for which I have either written or edited. 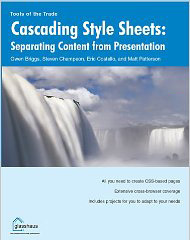 Depending on the need my role has ranged from technical editor to writer to lead author (locating other talent to help with the book). ISBN: 1904151043, Glasshaus. Technical Editor. ISBN: 1590594088, Glasshaus. Contributing author. 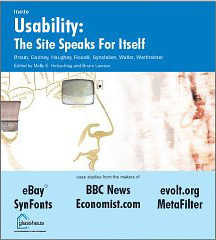 My first book project, I was lucky enough to have the opportunity to participate in this book as it presented case studies of evolt.org, eBay™, BBC News, Economist.com, Synfonts.com, and MetaFilter.com from a real-world usability perspective. Each of the case studies represented discusses the processes that went into the usability testing and development of each site. Each one shows that false starts, reassessment, and even assumptions are all part of the natural flow of any development. The evolt.org case study reaches all the way back to its formation and original site(s), and reveals many of the lessons learned along the way to building the current version of the site, as well as all the refinements we’ve regularly implemented since it was completed. This book received very positive reviews from readers on Amazon (holding on to a 4.5-star rating) as well as from independent sites and bloggers who reviewed it. 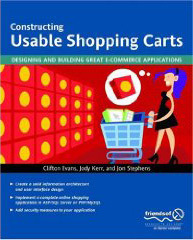 I served in the role of technical editor for this book, reviewing the manuscripts from each author for technical errors, code standards, consistent style, and general accuracy. It proved to be a great experience for all of us as we shared our own methods and techniques, as well as code formatting standards. This book made it to a second edition a couple years later. I was fortunate enough to have a hand in picking the other authors and lucked out when Isaac Forman, another evolter, was picked to write with me. Aimed at non-designers, we cover everything from color theory to typography to image formats to image optimization. There’s a lot of good stuff in here, and since it’s printed in full-color, it’s really quite nice to look at. The front cover is a photo taken by my brother, Paris Roselli, and each author had the opportunity to digitally manipulate the photo however he wanted, resulting in four interesting treatments. Each chapter is opened with the author’s manipulated image, which I suppose gives insight into their twisted design sensibilities (and yes, mine, too). 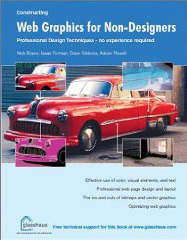 The book got great reviews from the community, particularly those who were more technically skilled and pressed into service as web designers. It maintained an average 4-star rating at Amazon for its run. 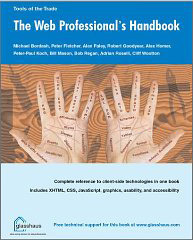 Developed as one comprehensive reference manual for web developers, my role in this book was to write the usability chapter and update the graphics format chapter from the design book I had just completed. This book is still in print and I know of more than a few places where it’s in regular use. I was brought in as a last-minute addition to the author team. One of the chapters needed to be updated and reviewed and my work on the other books and personal ecommerce experience made me a good fit. If you wade through the book you’ll see that many of the screen captures of sample carts bear my mark (literally, my name in some cases).